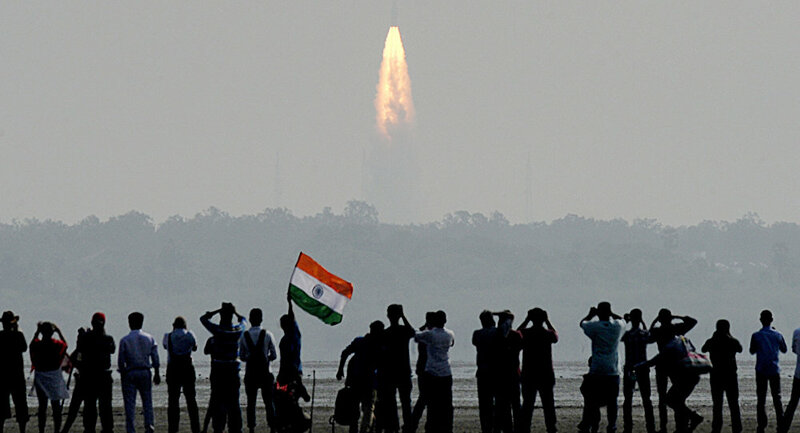 The Indian Space Research Organisation is all set to launch the $ 70.02 million South Asia Satellite on Friday, aimed at providing cost-effective and improved communications for South Asian countries. New Delhi (Sputnik) – The GSAT-9 is being launched with an objective to provide different communication applications in Ku-band with coverage over South Asian countries, the ISRO stated. The 28-hour countdown for the Geosynchronous Satellite Launch Vehicle (GSLV-Mk II) or more commonly referred as GSAT-9 satellite began on Friday afternoon around 12.57 Indian Standard Time. The GSAT-9 will be launched from the second launch pad at Satish Dhawan Space Centre in Sriharikota, Andhra Pradesh. The South Asia Satellite is Indian Prime Minister Narendra Modi's pet project tied to the larger foreign policy objective of India's 'Neighbourhood First' approach. First mooted in 2014 after Modi's inauguration, the PM on Sunday reiterated that the satellite would set a new milestone in addressing the region's economic and developmental priorities. "I welcome all the South Asian countries who have joined us on this momentous endeavour and the capacities of this satellite and the facilities it provides will go a long way in addressing South Asia's economic and developmental priorities. It is an important step by India to enhance cooperation with the entire South Asia; an invaluable gift and an appropriate example of our commitment towards South Asia," Modi said in his monthly radio address 'Mann Ki Baat'. Experts concurred and said that besides showing India's good neighborliness, it will further boost ISRO's image in the space industry. "PM Modi is right that the South Asia Satellite would go a long way in improving communications systems and mapping the region in various ways which could boost data collection in multifarious ways. Whether it is disaster management, telecom, resource extraction and other areas, it is truly a gift. It is unfortunate that Pakistan is not part of the project. They had concerns over data sharing and security but all others are supporting the project," Gp. Capt. Ajey Lele (Retd. ), Senior Fellow at the New Delhi-based Institute for Defence Studies and Analyses, told Sputnik. Barring Pakistan, all member states of the South Asian Association for Regional Cooperation (SAARC) are part of the project. Afghanistan is still going through some formalities. India has reportedly spent US$ 36.5 million (INR 2.35 billion) on the project. ISRO said that the GSAT-9 is configured around its standard I-2K bus, with a lift-off mass of 2,230 kg, and the satellite's main structure is cuboid in shape and built around a central cylinder with a mission life of more than 12 years.